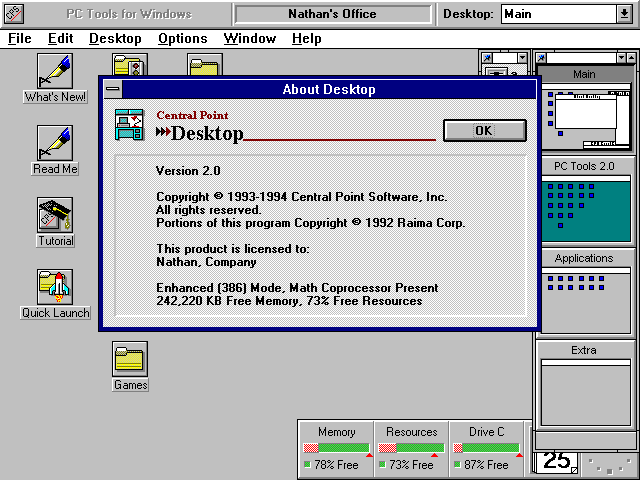 The Central Point Desktop is an alternate desktop shell for Windows 3.1 included with PC Tools For Windows Version 2.0. 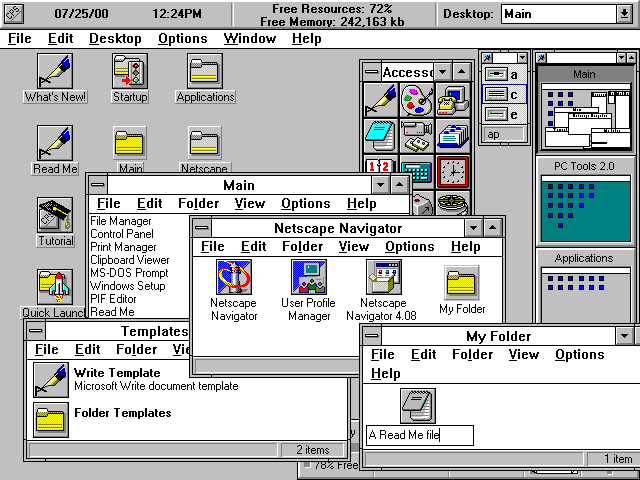 It starts up with Windows instead of the Program Manager, completely replacing its functionality while adding many features that Microsoft would not add to Windows until much later (and some features that are still not present). 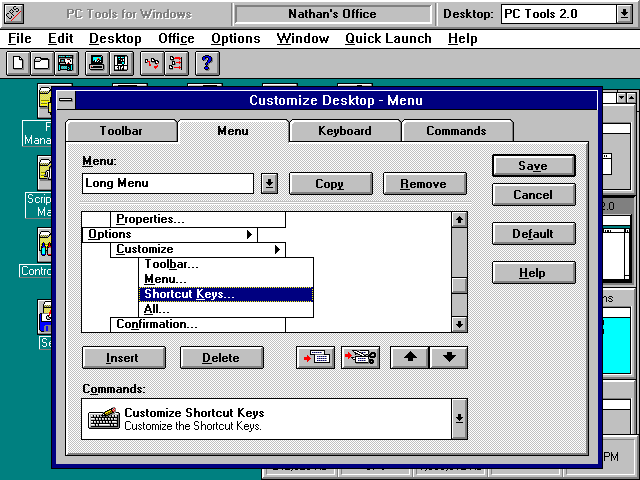 The desktop program has a customizable menu bar at the top (with optional toolbar), and "file item" icons (roughly equivalent to aliases or shortcuts) on the desktop workspace. A drive list window gives quick access to all drives on the system, and there is a status bar called "CrashGuard" that monitors Windows resources. Multiple desktop workspaces are available through a feature called "MultiDesk". By default 4 desktops are created: The Main desktop for imported program groups, the PC Tools desktop for the PC Tools utilities, the Applications desktop for documents associated with installed applications, and an empty extra desktop. These desktops are selectable by double-clicking the corresponding windows on the MultiDesk bar, or selecting it from the drop-down box on the desktop menu. Application windows that are opened on a desktop will only appear on that desktop. This allows many applications to be open at once without cluttering up the screen. Representations of windows that are open on other desktops can be seen in the MultiDesk bar. It is possible to drag and drop items between desktops by dragging and dropping them to the window of the destination desktop on the MultiDesk bar. This is the Main desktop. When PC Tools For Windows is installed it imports the Program Manager icon groups in to file items and folders on the Main Desktop. 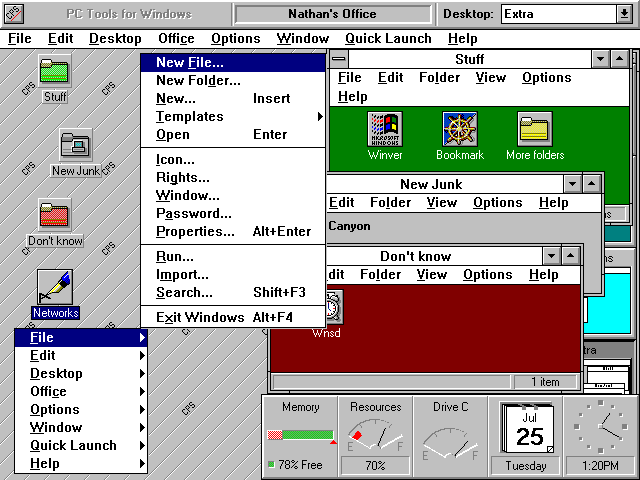 Folders open as new windows and the contents can be viewed as icons, a list, as text only, or as a toolbar. (Sorry, no mindless web page view) Folders may also contain other folders. 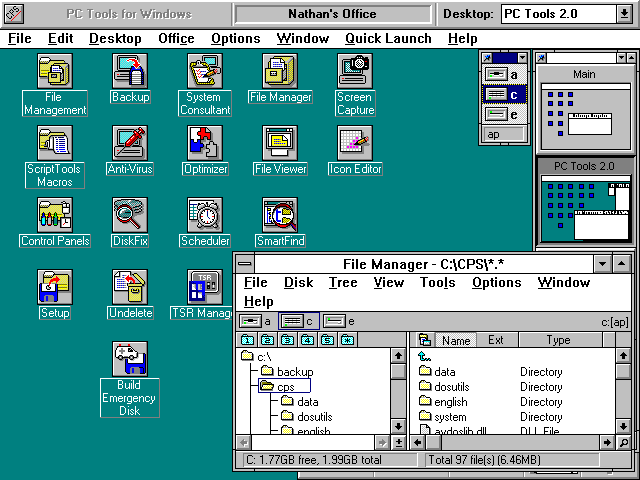 Unlike Windows 9x the file items and folders do not exist in the file system. All of the file items, folder items, and other desktop information actually exist in a database file maintained by the desktop program. This is the PC Tools desktop. It contains file items for all of the programs installed by PC Tools. This screen shot also shows the PC Tools file manager. 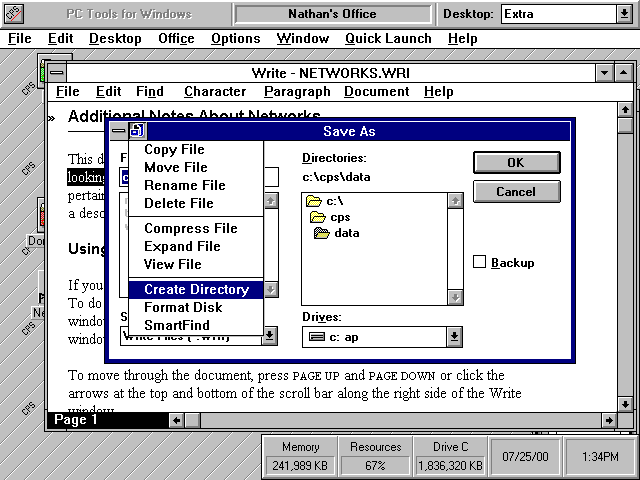 It is similar to the Windows 3.1 file manager, but it contains a number of enhancements that integrate it with the PC Tools utilities. The Applications desktop is set up to provide easy access to documents and the applications that create those documents. By default this desktop is filled with special types of folders that search the hard drive for files of certain types and displays them as file items. The file items may be given long names, but this can be confusing as the file that it points to must still have an 8.3 filename. Also, on this desktop I selected a different background. 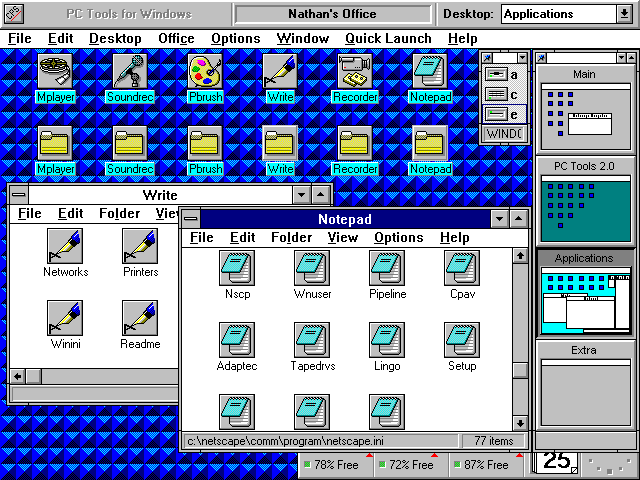 Each desktop may have a different background pattern or color. The Extra desktop is just an empty desktop to get you started on creating your own custom desktop. You can also add additional desktop workspaces or delete existing ones. A few other things shown in this screen shot: Each folder may have a custom background color (solid color only, no graphics). Folder icons can be changed to anything you like, when changing folder icons a default selection of alternate colored folders and styles of folders are provided. Right-clicking on the desktop or other desktop items provides a useful pop-up menu. Also, the CrashGuard status bar can be customized somewhat. As mentioned earlier, the entire desktop menu and an optional tool bar can be completely customized. Any menu item can be removed, and others can be added. There is also an option of using a default "long menu" that contains more advanced options, and a "short menu" that displays basic options. 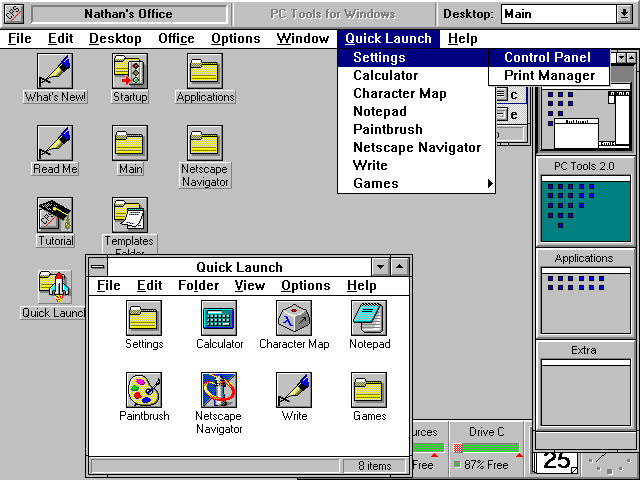 The long menu contains a "Quick Launch" menu that is customizable by placing file items in to the Quick Launch folder on the Main Desktop. Only basic Windows accessories are included by default, however I have added a few items and folders (such as the "Settings" folder to make it feel a little more 95-ish) in this example. Finally, the desktop also modifies the behavior of some common Windows features. As shown in this screen shot, it adds a file management menu to the standard "Save As" and "Open" dialog boxes. It also adds the Quick Launch menu to all system boxes.